I wouldn’t trust this man to carve a turkey, let alone carve up a bank. 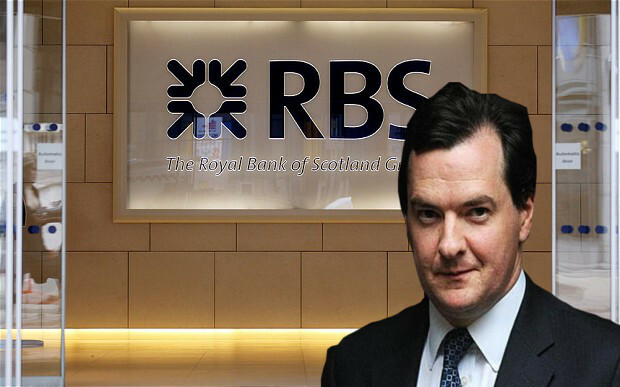 The papers are awash today with leaked ‘rumours’ that George Osborne is planning to ‘give’ shares in state-owned banking group RBS worth up to £400 to every voter shortly before the next general election. It’s obvious to anyone with a couple of brain-cells to rub together that this is the most crass, blatant attempt imaginable to buy popularity by bribing the electorate. What might be slightly less obvious to some is that – if it goes ahead – the government will be using our own money to attempt to buy our votes, to enrich private investors massively in the process, all while dodging a political ‘bullet’. Killing 3 birds with one stone, you might say. A big, fat stone with ‘Typical Tory Scam‘ written all over it in big, bold letters. Except, as usual with this lot, it’s not so much a stone as a lump of stone-baked bull-faeces. The ‘gift’ that goes on ‘giving’? The last Labour government invested £45 billion in RBS at the height of the banking crisis to prevent its collapse, effectively buying the bank and nationalising it – making it public property. That means we all already own it. So by ‘giving’ us shares in it, the government is doing nothing more than recycling what we own from one of our pockets to another – and then telling us it’s made us richer. continued taxpayer ownership of the bank is politically “untenable” amid rows over bankers’ bonuses, interest-rate manipulation and the mis-selling of financial products. The Tories and LibDems apparently consider that state ownership of the bank is ‘politically toxic’ because of continuing scandals over LIBOR fixing, huge bonuses and mis-sold financial products – and that the easiest solution is simply to get rid of it. I don’t know about you, but if I owned something I’d paid £45 billion for and it wasn’t working as it should, I’d want to fix it rather than giving it away to get rid of it. If it wasn’t my £45 billion, I’d feel even more responsible for making sure it was in working order for the people whose money had been spent on it. I wouldn’t try to give it back to them in pieces, hoping they wouldn’t notice that they were getting far less than they’d paid for it – 31% less, based on the current share price. But then, I’m not a Tory politician. It’s perfectly obvious that if there are problems at RBS, the best opportunity for fixing them is while it’s directly owned by us. It’s also perfectly obvious that owning a bank already is a gilt-edged opportunity to turn it into a ‘National High Street Bank’ that would help break the cycle of greed and misdeeds, and could provide an ethical, non-profit alternative to banking customers. The Tories are supposed to love ‘choice’, after all. But the government is adding insult to injury by hoping we’re too stupid to spot the scam. The vast majority of people receiving shares will sell them – a number that will be even higher because of the ‘planned misery’ of systematic impoverishment that has been inflicted on ordinary people by the very government about to perpetrate the ‘give-away’ scam. Because of how the stock-market works, the arrival of a large number of shares on the market in a short time-frame will push down the share-price. Large investors will snap up those shares at knock-down prices. ‘Hey-presto’, a public asset will once again be in private hands – for a fraction of its true value. Private hands that will, purely coincidentally, of course, be the very hands that provide substantial donations to Tory party funds. As investors do, once RBS belongs to private owners again, they will want to ‘streamline’ their asset to make sure that they squeeze every last penny of profit from it. Branches will be closed and staff will be laid off. Bank employees will find themselves unemployed – making them a net cost to the Treasury (i.e. us) via unemployment benefits, instead of contributors through tax and national insurance contributions – all so that private profits can be fattened further. Just as a (bitter) cherry on the cake, hundreds of thousands of RBS Group customers will be further away from their branches. The even higher rate of unemployment will have a downward effect on wages for all of us, further depressing the economy as a whole but allowing unscrupulous employers and investors to make even bigger returns. The Tories hope that enough of us won’t see this scam for what it is, so that it will give them a boost in the polls – and they’re cynically trying to have their cake and eat it by trailing it now but implementing it just ahead of the next general election. Let’s make sure they fail. If you realise someone is conning you, the right response is to get them hauled away in handcuffs, not to thank them for the ‘gift’. Get the word out and make sure everyone knows what a massive scam this is – and what a shameless, cynical, arrogant bunch of sociopaths are trying to perpetrate it. George Osborne is not a ‘fit person’ to be in charge of an empty shopping trolley in an empty car-park! These people do talk rather loudly, but who are they trying to convince? This Coalition seems to be embracing Third world political ideas. I think their judgement is badly flawed. But what kind of shares? Preference with a derisory rate of interest? Ordinary which may well tank when a rush to sell occurs? Or shares with Unlimited Liability? I would not put it past them. £45 billion shared amongst 30 million taxpayers (an estimate I’ll admit) is £1500. Even taking into account the fact we don’t own 100% of RBS – where’s the rest going? Don’t forget the papers were giving values based on the current share price, which was about 31% down on the price at which we invested £45bn, so there was already a massive loss. Disgusting behavior by elected cronies. Isnt bribary a job for the Serious Fraud Office – who have just had a massive budget cut?